Unless you’ve been in a cave for the last 5 years, you’ve heard of antioxidants. But what are antioxidants anyway? Technically, antioxidants are molecules that can donate an electron. Remember electrons? Those little negatively-charged dots that circle the center of an atom? Well, they like to be in pairs. 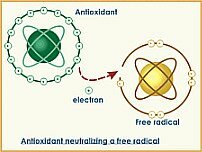 An antioxidant can give an electron to another molecule that has an unpaired electron, AKA a free radical. What are antioxidants good for? By donating an electron, antioxidants help stop the chemical reaction called oxidation. So what? Oxidation changes the structure of a molecule (and usually not for the better). Ironically, oxygen- that life-giving element we couldn’t live without- is also the major cause of damage to your body. That’s because it also causes this oxidation reaction in your body- it damages whatever part of your body it happens in. Think of rust- that’s an oxidation reaction. So basically, what antioxidants are important for is to help keep your body from rusting. Sounds ridiculous, but it’s not far from the truth. Antioxidants are so important that your body even makes its own. Glutathione and coenzyme Q10, just to name a couple. Most dietary sources are from fruits and vegetables. A lot of beverages are good sources too- like tea, coffee and even wine and beer! Click here for a list of antioxidants and where to find them.